Envoy is a blend of buffering agents, non-ionic surfactants and canola oil. Wetters (280 g/L) - Spreader, reduces the tension in droplets allowing greater coverage. Buffer (137 g/L) - Protects pH sensitive agricultural products from deactivation. 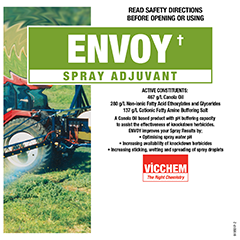 Envoy Spray Adjuvant is a unique 3 in 1 product designed for knockdown herbicides - based on Canola oil, it also contains a high concentration of Surfactants and a buffering system that is designed to enhance the performance of pH sensitive agricultural products in spray water with a pH greater than 8.0 or less than 6.0. Most Canola oil based adjuvants provide only oil and minimal wetter. Envoy Spray Adjuvant goes further by including a buffering system that is designed to neutralise spray water and protect pH sensitive agricultural products. Certain agricultural products (eg. Glyphosate) can lose some of their activity when mixed in alkaline water (pH>7). Other agricultural products may be sensitive to acidic conditions (pH<7) and lose some of their activity when present in low pH water. To minimise the loss of activity of sensitive agricultural products, simply add Envoy to the spray water first. Envoy is especially designed to bring the spray water’s pH into a neutral range (pH 6.5-7.5) refer to Product Info Sheet. The recommended usage rate for all applications of Envoy is in the range 200 mL – 500 mL per 100 Litres of the spray solution. For crop safety always strictly follow the directions on the agricultural products label and if in doubt about using Envoy always test by application to a small area before using it on a full-scale basis. Caution: Envoy is not recommended for use on crops, fruit trees, vines or other desirable vegetation as foliar injury may result. Envoy Spray Adjuvant provides 3 in 1 user convenience to reduce costs in time and money. Consistent and Reliable – Manufactured according to a quality management system. When used as directed, Envoy spray adjuvant will protect the activity of pH sensitive agricultural products in all types of pH conditions encountered in spray water. TRIAL 1 In pH 7 spray water, Envoy improves glyphosate performance. In pH 9 spray water glyphosate performance deteriorates while Envoy maintains glyphosate performance. TRIAL 2 The longer glyphosate is in contact with alkaline water, the less active it becomes. When Envoy is added first to alkaline spray water it neutralises the alkalinity and maintains glyphosate performance even when glyphosate has been in contact with Envoy treated alkaline water for 4 hours before spraying.